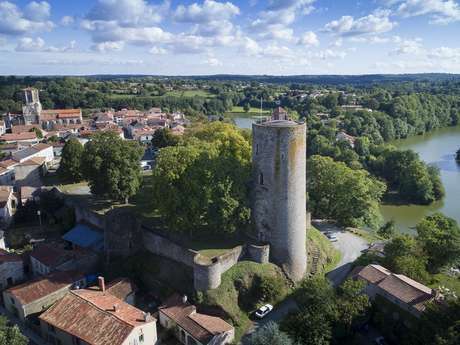 The village of Vouvant has a beautifully preserved old medieval fortress, ramparts and watchtower. 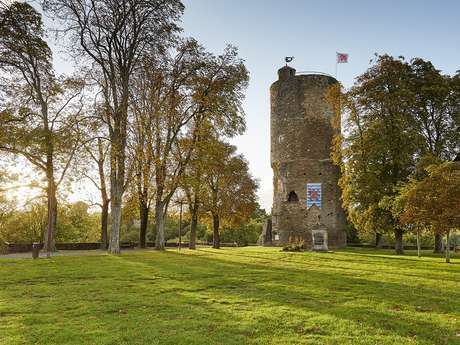 The Mélusine tower, the last remnant of Chateau Lusignan, offers a remarkable view of the forest of Mervent. Legend has it that Charteau Lusignan was built by Melusine the fairy. She is said to have built it in one night from "three stones and a sip of water." To visit the tower, ask for the key at the Café Mélusine located on the Place du Bail facing the building. In the tourist season, the key can be obtained from the Tourist Office. The 13th century circular tower (an exceptional shape for the time) has a large square base, bypassed by an external staircase. A first platform, overlooking the square, brings you to the front door. Then climb the narrow spiral staircase that leads to a vaulted dome. A knight in armour who sports the coat of arms of the Lords of Lusignan watches over the peace of the tower. To reach the upper floor of the tower, the first steps from the second floor surprisingly turn in the opposite direction to the exterior stairs. This judicious technique made it possible to counter attackers and slow them down. Arriving on the upper platform, the 360 degree view reaches to the distant horizon! 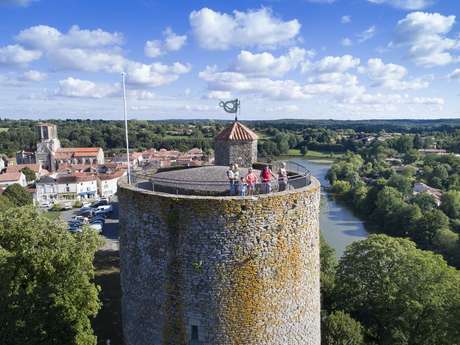 From the top of the 45 meters of the tower, crowned with its weather vane, again depicting the fairy, you can contemplate the landscape of the bocage. In the distance you'll see the forest of Mervent, the "wood of madness" at Pouzauge and the village of La Châtaigneraie. The view of the medieval streets of Vouvant invites you to climb back down and continue your visit of this charming "Town of Character."